Seventeen year old Violet is on her own in the summer of 1977. Her parents are on a road trip, following the trail her older brother, Bliss, took after he left home shortly after his graduation. Violet is responsible for the running of the family business, an antique shop in a big, purple barn, until they return. The day to day running of the shop isn't too difficult. She has a reliable staff, including her own boyfriend. There is a steady stream of tourist traffic; no one can resist stopping at a purple barn. She has work to keep her busy, her boyfriend, and best friend Jill to occupy her free time. Still, she can't keep her thoughts from straying to Bliss, his depression, and why he left them so suddenly. Violet remembers her childhood with Bliss. What was the cause of his sadness? She can't help but think it started after they found the boneyard when they were kids. The boneyard was a pit hidden deep in the woods, where the transportation department dumped the bodies of animals struck by cars on the highway. The boneyard affected Bliss deeply. During his darkest moments, he would talk about the pit and how it made him feel. Throughout her childhood she found ways to keep Bliss from thinking of the boneyard, but his mind would always return to it. In the present time, Violet's parents receive a once in a lifetime opportunity: the sale of the contents of the legendary Vaughan summer house, a house abandoned decades ago after a family tragedy. It's a house frozen in time. With her parents away, it's up to Violet to seal the deal. 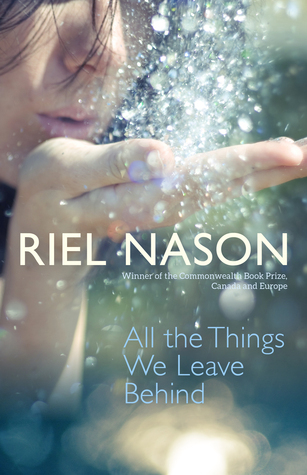 All the Things We Leave Behind is a quiet, coming of age novel. Violet has adult responsibilities, while still trying to live the life of a teenager- making out with her boyfriend, and hanging out with friends. Underneath it all is her concern for her brother and what responsibility, if any, she had for his leaving. It's a long journey for Violet to realize that people are going to do what they're going to do. "It just, I- I feel sad, like something sad happened. I don't know- I just- maybe it's something I should have felt bad about before, but forgot to?" Violet's family doesn't understand it either. They love and support him and realize that it's a part of him, but it's beyond them. His leaving to "go exploring" frightens them, because as his mom puts it, "It's Bliss." If the boneyard is a metaphor for Bliss's unhappiness, then the antithesis is Speckles, the albino deer. Speckles is "Bliss's deer," the deer Bliss spotted in the woods, an animal he has a connection with. Late at night, Violet spots a mysterious glowing deer. Speckles? As long as Violet knows Speckles is okay, then Bliss is okay too. But Violet knows that people give meaning to things that aren't always there. Violet's family deals with the belongings of the dead. These items once occupied a place in their lives and after their passing bring joy to new people. The new owners imbue these items with meaning without truly knowing what these trinkets meant to the past owners. A candy dish might have just been something unwanted hidden in a cupboard. But if believing in a fantasy brings someone happiness, what's the harm? Bliss himself was interested in what made others happy. What was the secret and why was it so elusive? The events leading up to Bliss's disappearance, her parents' search, and how Violet came to be left alone all summer are revealed piece by piece throughout the novel. There were questions that kept creeping into my mind that were eventually answered. It's a slow journey, but one that's worth it. This is definitely a novel that sneaks up on you. Thanks to Goose Lane for the review copy. All opinions are my own. This sounds really good! I haven't seen it around at all. I'll have to look more into this one. I've just finished her first, in anticipation of this one: really looking forward to it!